Washington University in St. Louis was founded in 1853 by Wayman Crow, a prominent St. Louis merchant, and his pastor William Greenleaf Eliot Jr., who both saw the need for more institutions of higher education in the growing Midwest. Today, the university’s two main campuses, Danforth Campus and Medical Campus, total 333 acres and 150 major buildings. St. Louis represents the ideal balance of small town feel and big city opportunities, is a national hub for important research and business development, and boasts more free, world-class attractions than any place in the nation outside of Washington, D.C. Paving the way as a leader in teaching, research, patient care, and service to society, WashU is committed to learning and exploration, to discovery and impact. The university’s seven schools and broad spectrum of academic programs challenge faculty and students to create new knowledge for an ever-changing world. The interdisciplinary approach at WashU allows for both in-depth learning and the ability to explore your many interests. With 80% of students pursuing multiple majors and/or minors and a student to faculty ratio of 8:1, the university offers wide-ranging opportunities to push your boundaries of learning and deeply engage with faculty. Beyond the classroom, highly individualized career and academic advisory services help students translate their studies and interests into careers of passion and purpose. The vibrant and inclusive campus environment welcomes students from many backgrounds and prepares them to live and work in an increasingly diverse world. Students thrive on being a part of a community of individuals who are involved in civic engagement, and dedicated to pursuing their passions and enhancing lives of others. 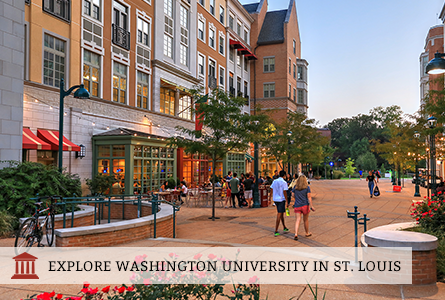 Fun fact: Washington University in St. Louis has been affiliated with 24 Nobel Laureates, including a connection to T.S. (Thomas Stearns) Eliot, a grandson of the founder, native of St. Louis, and winner of the prize for Literature in 1948.